Alachua County was named by the Indians for its natural features and some believe that Alachua is the Indian name for sinkhole. So perhaps rightfully, the sinkhole next to I75s exit 399 has been called Alachua Sink. Sheck Exley and Court Smith are some of the first known explorers of the sink. During dozens of dives, they discovered several large rooms in the system. A copy of the original survey map made by Exley shows that he calledthe first room "Crayfish Haven," followed by "Danas Room," and finally "Lewis Room." Exley and other team members explored and mapped a total of 2,250 feet (686 meter), both upstream and downstream. Diving Alachua Sink today requires permission from the NSS-CDS, which owns the site, and a guide. Divers must be a member of the NSS. The system is considered an advanced cave dive, requiring "Full Cave Diver" certification and proof of the Abe Davis Award or equivalent experience. In addition, divers must have documentation of at least three prior dives to a depth of 150 feet (46 meter) with required decompressions of 45 minutes or more. Dive teams will be limited to one guide and two divers, except for the upstream section beyond the 180-foot depth, where diving will be limited to one guide and one diver. In order to dive the downstream tunnel, the diver must complete three dives in the upstream section. Dives in the downstream tunnel will be limited to one guide and one diver. The NSS-CDS requires that all divers sign a liability waiver prior to diving, since several accidents happened in the cave. Michael Menduno published the following report in AquaCorps: "A newly trained cave diver got lost in the cavern zone after being separated from the team's line in zero visibility conditions at Alachua Sink and drowned. His partner survived. Instead of following the permanent line which begins at a log in the basin, the team ran a reel during the evening dive in order to make their way down through the sloping cavern zone to the main tunnel. The basin had near zero visibility conditions due to the seasonal algae bloom which usually clears up at about 130 fsw at the upstream/downstream tunnel junction. About 60-80 feet into the dive, the team realized they had missed the main tunnel. After searching for the tunnel for several minutes in 3-4 foot visibility they decided to turn the dive and lost visual and physical contact of each other. The surviving partner reeled in believing his partner was ahead of him on the line. Reaching the surface alone and realizing his partner was still in the water, he attempted numerous line searches in order to locate the diver without success and went for help. Though the lost diver had several hours of gas in his double 95's he was unable to find his way up and out of the funnel shaped cavern zone. A contributing factor may have been that he was only carrying a 50 foot jump reel rather than a 150 foot safety reel recommended by the cave diving training agencies. Ironically, if the dive had been conducted during the day observers speculate that it should have been easy to find a way out." The sinkhole slopes steeply nearly 50 feet (15 meter) down to the water's edge, which is very dark and tannic-stained for most of the year. Clear water is usually not encountered for a considerable distance into the system. Both the upstream and downstream tunnels in the main cave system have depths reaching 180 feet (55 meter) and deeper. A considerable restriction at a depth of 195 feet (59 meter) needs to be negotiated before divers can continue to explore the siphon-tunnel. Frequent changes in depth, called the "Roller Coaster," put divers at an increased risks. Until a wooden staircase to access the water was built several years ago, most divers relaxed another 15 minutes on the surface to off-gas before negotiating the steep hill leading to the parking area. Considering the advanced dive profile, this is still good practice even if the computer cleared the diver. The NSS-CDS currently allows diving only for research, data collection, water sampling, and survey/mapping projects. No training activities are allowed in the system. Dye tracing studies in the 1970s revealed that Alachua Sink is connected to nearby Hornsby Springs, which is considered a tributary water source for the Santa Fe River. 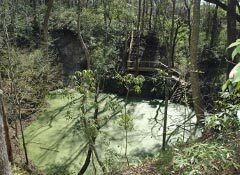 The Florida Geological Survey renamed the sink in 2003 in Mill Creek Sink to avoid confusion with the Alachua Sink located 25 miles (40 kilometers) to the south near Payne's Prairie. However, most cave divers continue to use the name Alachua Sink. The cave can be located at 29° 48' 4" N, 82° 30' 30" W.